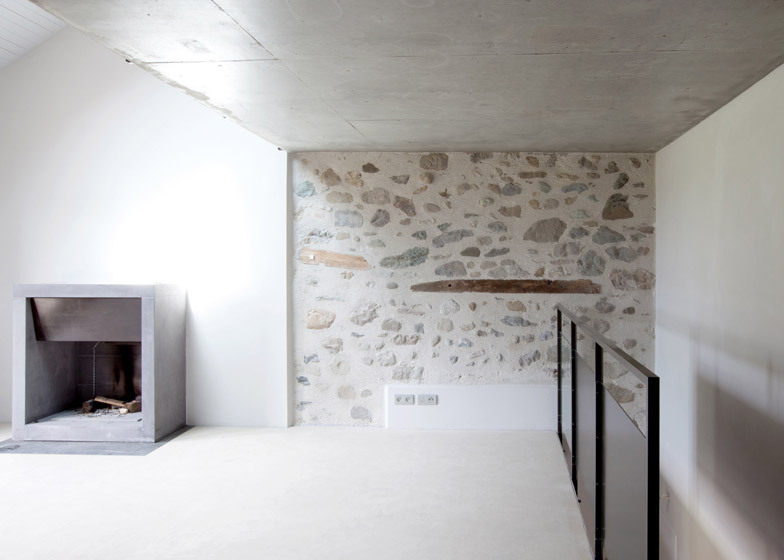 Walls made from a traditional combination of stone and hemp-based plaster contrast with concrete, steel and glass details at this renovated house in the French village of Douvaine (+ slideshow). 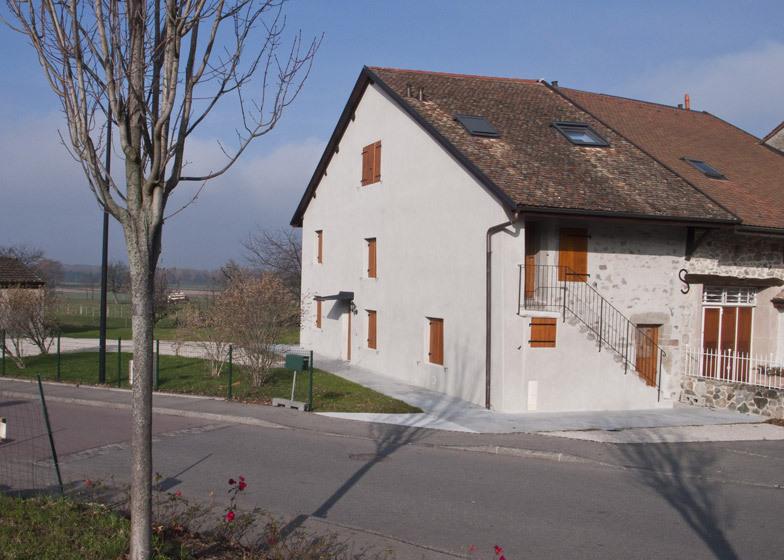 The property is located close to the shores of Lac Léman on the French-Swiss border. 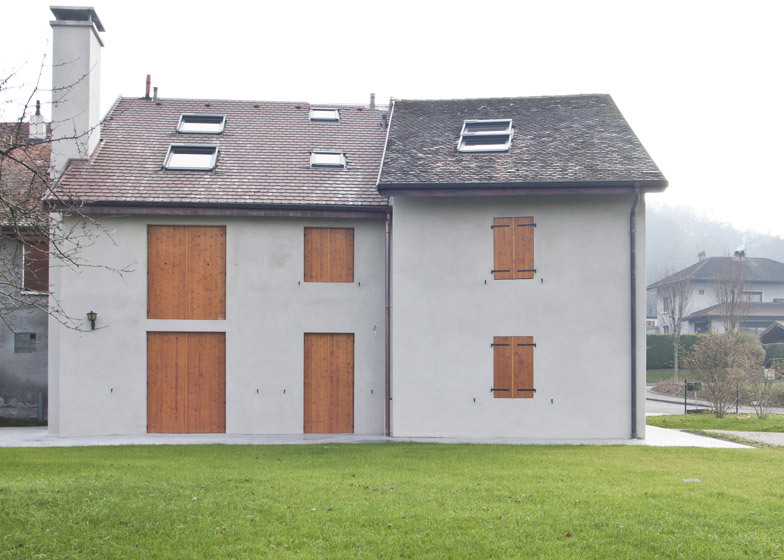 It had fallen into a state of near ruin before being purchased by a family, who then asked Swiss architecture office FRAR to transform it into a holiday residence. The building originally comprised a house on the end of a terrace with a barn attached at one side. FRAR connected the two structures and reconfigured the plans, creating linked but independent units for the owners and their two teenage children. Despite the building's poor quality construction, the local council insisted that it should be preserved in its original condition as much as possible. 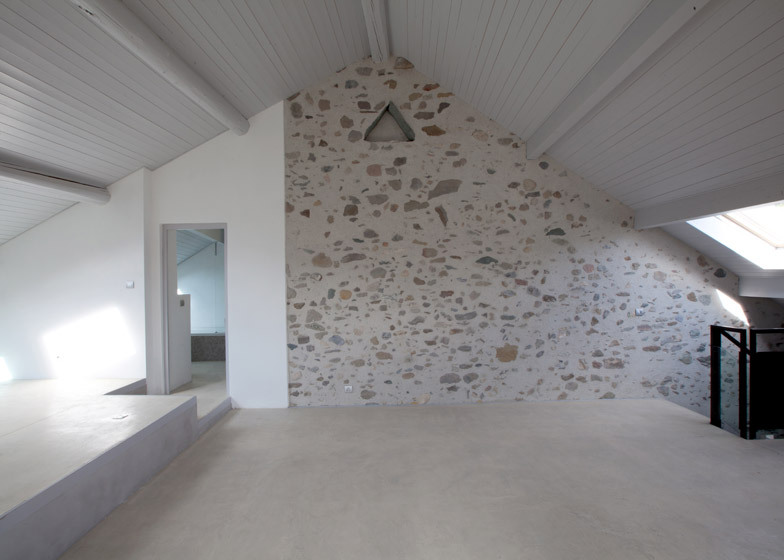 The only permitted alterations were the addition of windows in the barn's south facade. 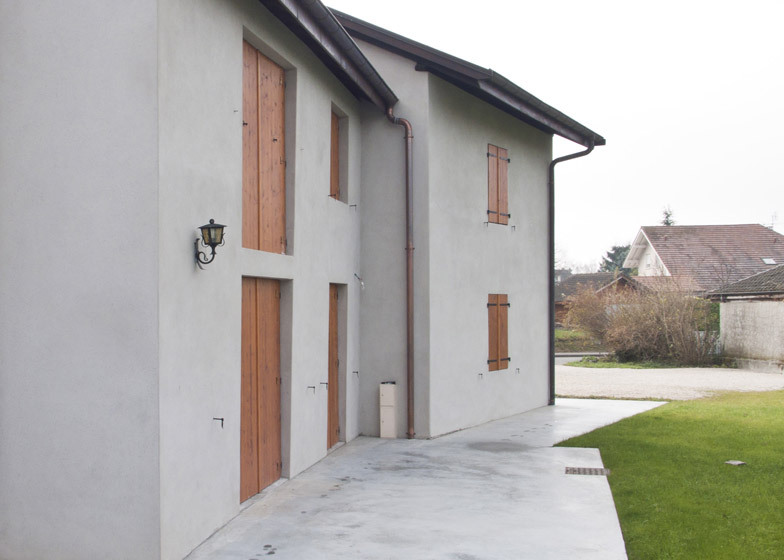 A roughcast plaster was applied to the facades to match the other houses on the street, and solid-oak shutters were added to the windows to provide a warm and contemporary complement to the textured exterior surfaces. Due to the lack of structural integrity in the original stone and earth walls, concrete was used to cast new foundations and floors. A concrete core was also inserted, providing lateral stability whilst creating new bathrooms on both floors. The building's existing plan featured three rooms in the main house and another in the barn – all with similar dimensions. The same is the case in the new layout, although corridors have been reorganised to meet the needs of the current occupants. "For us, the important characteristic of the old house was its typological simplicity," explained architect Kaveh Rezakhanlou, who founded the studio in 2001 with colleague Eric Frei. "The project celebrates this by making a house composed of similar sized rooms but connecting them differently, horizontally and vertically," he told Dezeen. Throughout the interior, renovations focus on retaining the character of the original spaces and materials. The walls – which present a mixture of stone and hemp-based plaster – have been left exposed in every room, and a minimal approach to furnishings allows them to become a prominent feature. "We never intended to plaster the whole thing inside like some newly built apartments, although the temptation was there because the stone walls were so poorly built," said Rezakhanlou. "It was about restoration and refurbishment," he added. "The old and new become complementary and you appreciate one because of the other." The building's ground floor now accommodates the main apartment, with its kitchen, double-height reception area, living room and a guest bedroom. A concrete stair with a glass and steel balustrade ascends to the mezzanine level housing the master bedroom. The mezzanine also provides access to the other two self-contained living units. Stairs lead from a kitchen on one side of the mezzanine to the daughter's apartment in the loft space. Its ceiling is lined with sheet metal and punctured by skylights. The son's apartment is housed in the old barn, and is accessed using a staircase next to the building's rear entrance. It is split over two levels, with a living room on the first floor and a bedroom above. Rezakhanlou summarised the building's transformation as simple rather than contemporary. 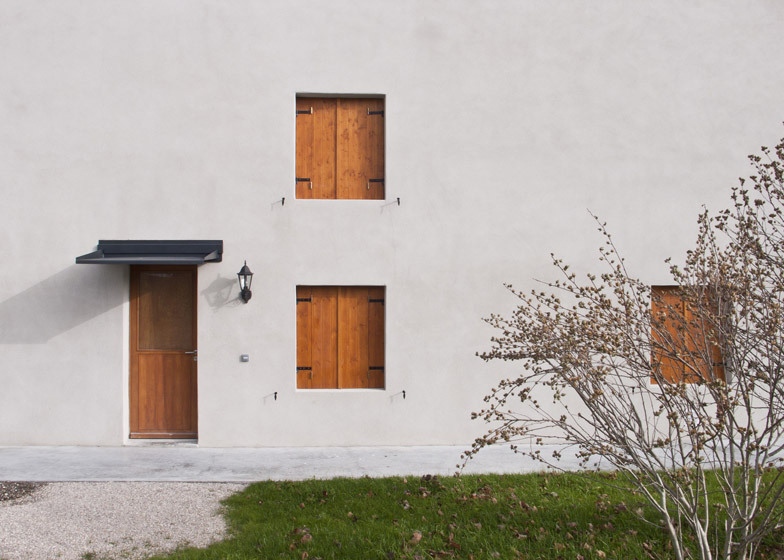 "The house in Douvaine is not so much a 21st-century home, technologically speaking, it is a simple village house," he concluded. Other recent European barn conversions featured on Dezeen include a 17th-century structure converted into a printmaker's studio and a run-down old cattle shed turned into an Alpine holiday cabin. Photography is by Romain Blanchi, unless otherwise stated.